When Taylor Swift dropped her sixth record, Reputation, back in the fall of 2017, a few people were quick to note all the references to alcohol — 13 in total — that when matched up with a cumulative mere four references to adult beverages on previous records, raised some eyebrows. Why six records, nearing her 30s, spawned by Big booze-loving Country, a millionaire umpteen times over, and just discovering the “old fashioned” (“Getaway Car“) or the time-honored pleasure of “Island breeze and lights down low” (“…Ready For It?”)? And though questions such as these have remained unanswered by Swift, fans have had their fun speculating conspiracy theories. Many of which are as transparent as a window in the fact that Reputation was Swift’s grand bad-girl branding push. 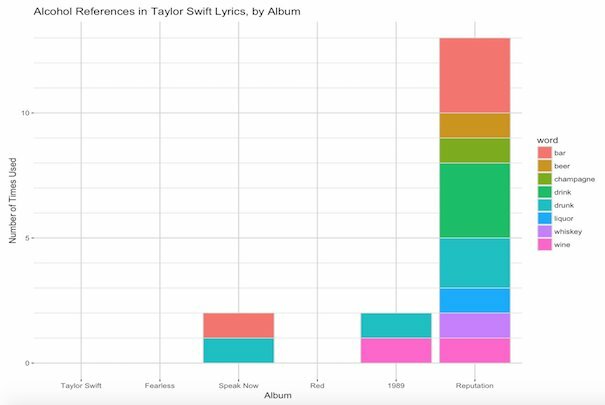 Anyway, a big data nerd on Reddit got to visualizing all these references into graph form, because what good are computers and huge databases of lyrics if not to find the saddest Radiohead song, how rap is actually the least drug-refferencing genre, and of course — how infatuated Taylor Swift is with branding herself Queen of the Hooch. Enter Joe Hovde from Cincinnati, Ohio who took all of Swift’s mentions of alcohol in her entire oeuvre and put it into a bar graph. Since posting his work to the intranets, fans are once again coming out of the woodwork to marvel in Swift’s appreciation of whiskey on ice.